Screenshots from Youtube pursuant to fair use for educational purposes. (APN) ATLANTA — Atlanta Public Schools Board of Education Member Courtney English (At-large Seat 7), candidate for the Post 1-at-large seat held by Councilman Michael Julian Bond, has been recently caught to have made made two false statements. A recent article by Atlanta Progressive News, dated October 06, 2017, revealed that a senior homestead property exemption had been claimed for at least two years on a Merrill Street property that he also claimed to own. English is by no means a senior citizen and clearly was not entitled to the exemption, which brought down the property’s APS tax assessment to as low as seventeen cents in one of the years. APN noted two possible scenarios based on the facts as of October 06: one, he falsely claimed the exemption and evaded property taxes earmarked for school children; or two, he falsely claimed he owned the property. Well, Mr. English appears to have chosen the second scenario. “I didn’t buy the house,” he told the AJC. Additionally, English has now updated his state ethics filing to indicate that he does not own property in Fulton County, according to the AJC. Therefore, while he does not use these words, he admitted to making deceptive statements. And yet Courtney English continues to lie, insisting that Councilman Bond–who sent out a mailer regarding English’s property tax situation–had lied. Even former Mayor Shirley Franklin has allowed herself to get caught up in the mix. Franklin–who was instrumental in getting Councilman Andre Dickens (Post 3-at-large) on the City Council in 2013–believes she can put another ally in office when it comes to Mr. English. Franklin and English share the same philosophy as strong advocates of charter schools and privatization of education. 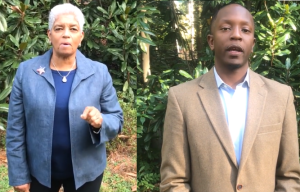 “When you get Michael Bond’s attack piece on Courtney English, don’t believe it!” Shirley Franklin said emphatically in an October 21 video posted to Facebook. “Michael Bond is lying,” Franklin said. “Well… Mr. English’s past situation is well-documented. He’s acknowledged it. He’s even acknowledged that he wasn’t one hundred percent truthful. I find the allegation disappointing, and equally as shocking, coming from someone of Mayor Franklin’s supposed stature,” Bond told Atlanta Progressive News. “I want to further say, I’ve known Shirley Franklin since I was eight years old. I’ve never had a disagreement with her privately or even publicly and I’m just saddened and dismayed by her behavior in this campaign and equally puzzled by it,” Bond said. “It’s one thing to support a candidate, it’s another to just launch an assault… to just go beyond the pale,” Bond said. This issue began with English’s deception. Mr. English is the one who claimed to own the property in the Georgia Stand Up debate and in his state disclosure, even though he did not own the property. Instead of admitting to making the deceptive statements in the video, English puts the blame on Councilman Bond for raising the issue. APN also raised the issue, but English has never responded directly to APN, despite APN sending English an inquiry the day before the first article was published. “They have no message but division, obfuscation, and hate,” Bond said. As previously reported by APN, Mr. English has had long-standing issues involving honesty. He previously misused an APS credit card; was warned; and then did it again. When he misused the APS credit card on the second occasion, he had the Alisias PR firm send out a message from him apologizing and saying he did not know better, even though he had, in fact, been previously warned by APS. English’s misuse of the credit card, and honesty issues around it, were two of many Board governance issues covered in the AdvancED/SACS report, which led to APS’s accreditation being placed on probation. FULL DISCLOSURE: As APN has consistently disclosed, APN’s News Editor, the present writer, has served as a supplier for the Office of Councilman Bond since 2014. APN’s Editor has received small consulting payments for such services as legislative drafting. This year, APN’s Editor drafted Councilman Bond’s Surplus Property Affordable Housing Ordinance, which is set to pass Full Council at the November 06 meeting. Try as you might you can’t make Courtney English the villain. He corrected his mistake on the form. On the other hand Mr. Bond still hasn’t paid is $45,000 fines or acknowledged his repeated wrongdoing. Bond stole money from the city and taxpayers. In addition, he has accepted money from the Prad Group whose offices have recently been raided by the FBI and money from the Mayor’s SLUSH Fund. He appears to be tied to the corruption at City Hall. Bond needs to be fired by the voters. The Councilman is claiming I improperly claim a senior tax exemption. This is false. I live with my aunt, Joyce English. My aunt and mother bought and shared their home for almost 30 years before my mother passed away from cancer in 2012. As my mother’s medical bills and failing health began to overwhelm her, I moved back home to take care of her and shoulder her living expenses during her final days. After my mom passed, I stayed in the home to look after my aunt, who will be 75 years old next year. During and after my mom’s illness, and up to this very day, I have helped pay my mother’s part of the mortgage so my aunt could stay in the house she has called home for more than three decades. My aunt’s name is and has been listed on the mortgage and she claims the senior exemption to which she is fully entitled. In fact, if you look closely at the tax document on the mailer referenced in the article, you will see my aunt’s name—Joyce English—listed next to my mom’s. The disclosure form in question asks if you have “ownership interests” in any property that exceeds 5K. Because I had paid more than that into the property at the time of the disclosure, I thought checking the box was appropriate. I checked the box in an effort to be transparent. Of all the attacks, this lie is the lowest. The idea that someone would take such a personal family matter and manipulate it in this manner is appalling. Worse, it drew my aunt, a senior citizen and lifelong Atlantan, into a manufactured scandal when she hasn’t done anything but serve her community and her church and help raise my cousin and I. No one is skirting the law. I was looking after my family. Moreover, it’s interesting that you’d pick up this story and fail to mention to your readers that the mailer that you reference (and you acknowledge that was sent from the Councilman) is illegal as it does not list who paid for it. Its contents are either flat false or distortions of the truth. You also fail to mention that Councilman Bonds camaoign is being bankrolled by the PRAD group who is currently under investigation by the FBI for “pay to play” or the tens of thousands of doallrs hes spent camapigning. And this week, we learned that the Councilman has also received potentially illegal contributions from a campaign committee set up to support transportation improvements. That’s fraud at best and moneyl aundering at worse. Campaign aside, I’m certain these issues will be investigated by the US attorney or the FBI. City hall is under a cloud of corruption and Michael Julian Bond is the tip of that iceberg. Thank you for this incredible excuse….I mean explanation. Sadly, none of these statements have anything to do with the fact that you stood up in front of a room full of people and lied. I tell my son that there is no place for excuses, when you are wrong you apologize and make amends. Any missteps my brother made have been acknowledged and he is currently making amends. Especially when holding office, you must be prepared to accept both your successes and mistakes. The tax payers are not going to have time to hear you spin more tales as to why you don’t know the right choice to make. I think that alone shows why you can’t possibly think you are ready for this job. I guess it’s just another example of you not knowing any better. However dishonest and disrespectful you and your mentors statements have been, I think it’s impressive that one feels the urge to and struggles so hard continue to attempt to remain relevant. Bond has never lied to the public, to any public official, in any public statement, any public meeting, any public document, or any public testimony. Bond brought his campaign issues to the state of Georgia himself, and is in compliance with the agreement that was reached. He has always taken full responsibility for his public actions and remains publicly accountable to the citizens of Atlanta, and completely truthful with them at all times. Bond is not now or has he ever been, subject to any investigations or inquiries by investigative authorities, and is endorsed by the highest law Enforcement official in Fulton county, and former FBI agent Sheriff Ted Jackson. Bond, unlike his opponent in this race, has never waged a negative campaign. Bond believes in running on ones record on their accomplishments on behalf of the Citizens. Bond’s opponent in this race has no meaningful accomplishment and cannot run an effective campaign based on their record. For Their record is one of failure, excuses, and obfuscation. Bonds opponent in this race has presided over the largest and most bloated bureaucracy per capita in the state of Georgia, with the highest tax rate, and lowest graduation rate In the metro area, far below the state average. They have depleted the system reserves now it’s 60 million down from 100 million in 2010. They have left their pension issues unresolved from 2010 levels at 18%,Now only at 19% funded – at 15% funded the system would be insolvent and would require take over from the state of Georgia and a financial bail out from Atlanta taxpayers. Under the leadership of Bond‘s opponent the system faced a $24 million short for just this year But then borrowed and astonishing$100 million to cover it’s Operations. This is the second year that APS has had to borrow to run its operations. Last year 2016 they borrowed $20 million, Though they receive the largest amount in taxes than any local government – almost twice the rate the CITY OF ATLANTA receives. Mismanagement and ineffective leadership have been the hallmark of Bond’s opponent. Bond’s opponent in the above article with his own statements and actions, has Also proven himself to be a liar. Bond is committed and accountable to the citizens of Atlanta And enjoys the endorsement of Great Atlanta Leaders such as Congressman John Lewis, Governor Roy Barnes, MAyor Kasim Reed Ambassador Andrew Young, Senator Nan Orrock, Representative Beth Beskin among others. Please go to BondForAtlanta.com for information about the candidate, his positions and accomplishments. I don’t know what is sadder- the fact that your candidate is so weak that you have to rely on on a shrill has been to to be your mouthpiece or that the fact that Shirley Franklin is so desperate to remain relevant that she would back a convicted criminal for public office. To me being indignant about being caught in a lie and decrying negative campaigning when that is what you have been doing all along is cowardly and hypocritical. Shirley Franklin hired Adam Smith as well as an alcoholic for police chief. It’s sad that she is ruining her already tarnished legacy. It makes one wonder who is actually the candidate. This lying criminal is the only person foolish enough to let her near their campaign and I can see why. Negative attention is still attention right? She’s using that poor man to get in the spotlight again after leaving office in shame. What excuse, my bad, “reason” do you give your son for your numerous ethics violations and that you are seated as councilman with less than 50% of the vote ?